In this post I’ll be sharing with you some photos of Clarendon Park taken in the 1980s and 1990s. 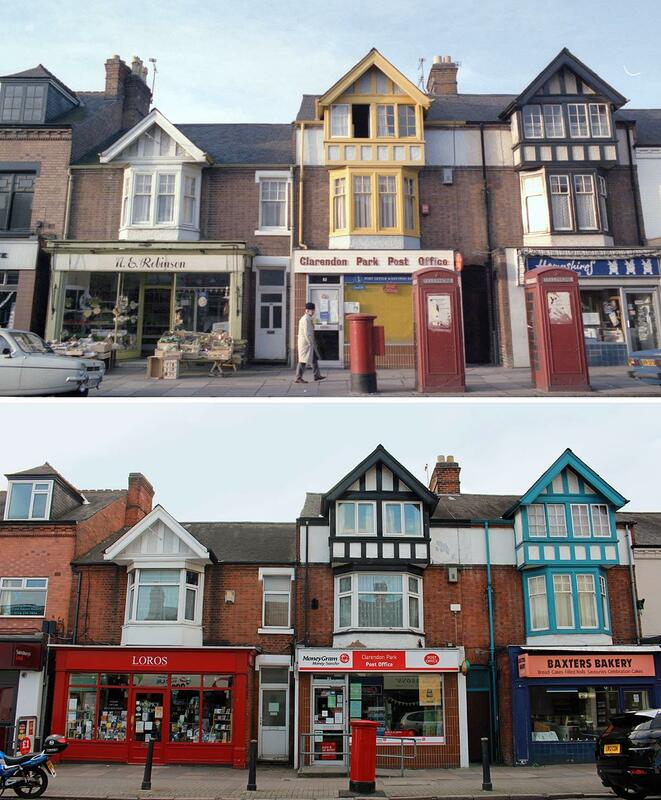 I’ll also be asking for your help in identifying the location of a couple of old shops that I’ve been unable to track down – check out the photos at the bottom of the page to see if you recognise them! The older photos in this post were sent to me by William Newton, who grew up in Clarendon Park between 1943 and 1961. 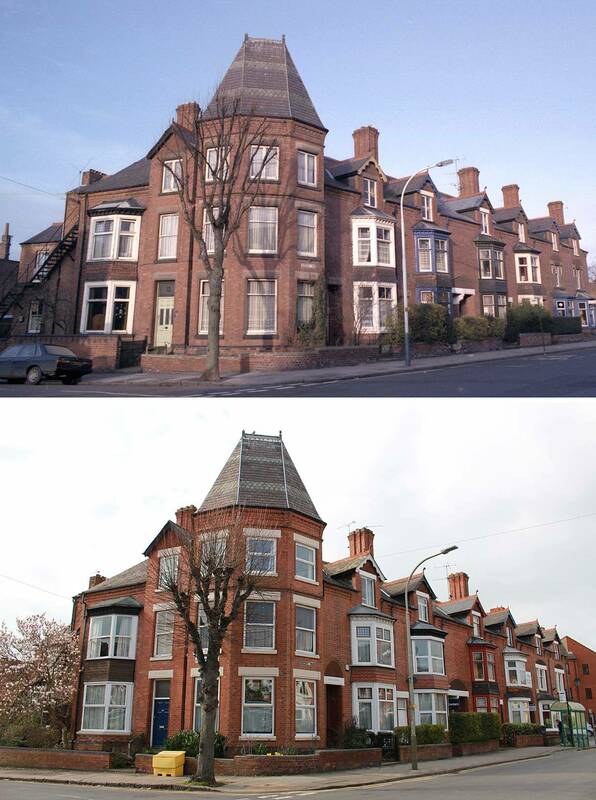 William’s parents were still Clarendon Park residents until the late 1990s, and it was while visiting them that he embarked on a project to document some of the more interesting buildings and shops in the area. In putting this post together I was particularly interested in highlighting the changes that have taken place over the last 20 to 30 years, and for this reason I decided to try to recreate William’s photos as accurately as possible. It was really a lot of fun going on these photo shoots, following in William’s footsteps and attempting to take each photo from exactly the same viewpoint. The results are interesting – some residential vistas are virtually unaltered, while many shop fronts have changed almost beyond recognition. I’ve included a bit of commentary on each photo giving some background information about what’s shown. I’ve gone for an eclectic mixture of historical details, recent gossip and obscure facts. If anything in these photos prompts your own memories please do share your story using the comment box at the bottom of the post. The photo on the left must have been taken not long after Christopher James Deli was established in Clarendon Park a little over 25 years ago. This small family business has been a permanent fixture on Queens Road ever since, selling cheese, meats, bread, cakes and a whole host of local products. In fact their website boasts that “there is almost nothing we cannot provide”. For my Sweet Treats article last year I set myself the challenge of finding Clarendon Park’s tastiest sweet nibble. Christopher James Deli’s peanut-butter and chocolate brownie came out tops with the judges, making this shop a must-visit for anyone with a sweet tooth! 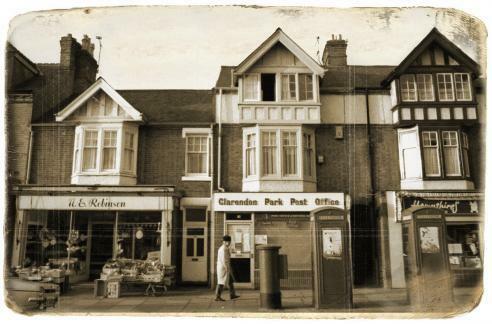 Clarendon Park Post Office has been in its current location at 83 Queens Road since the end of the nineteenth century. My fellow blogger, Elizabeth over at Your Histories, has written about a robbery that took place there in July 1888. This event involved the theft of less than £20, a sufficiently princely sum at the time to warrant an article about the crime in the Leicester Mercury. Hampshires Bakery, on the right of the shot with its signage partially obscured by the phone box, has its own place in history. In August 1987, the manager of Hampshires, Ian Kelly, joined a few colleagues in The Clarendon pub for an after work drink. Later that evening, no doubt after a couple of pints, Ian let slip a secret that led to another local man being convicted of murder. If you watched the ITV drama Code of a Killer a few weeks ago you’ll know the rest of the story. Find out more in my earlier post here – in the comments section you can also read the story of how Hampshires became Baxters in 2009. 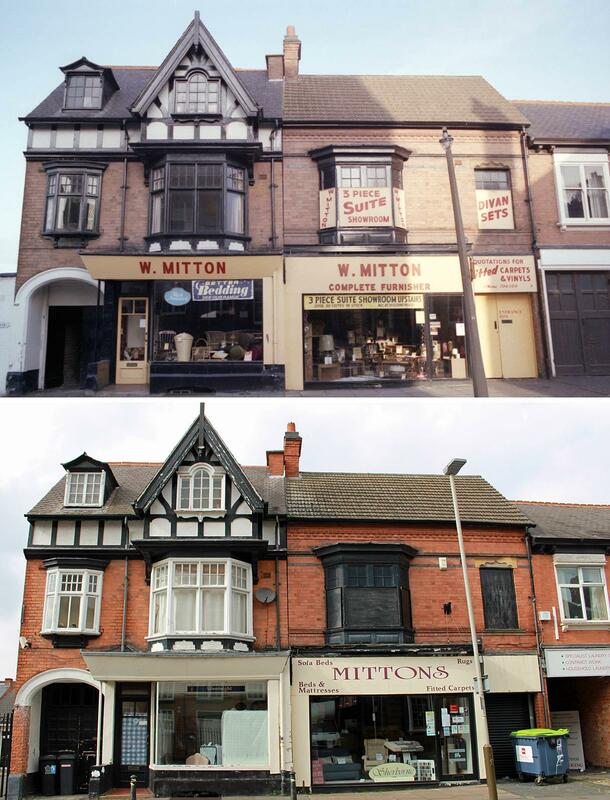 The Mittons family have been trading from their Clarendon Park Road premises since 1952, making their sizable flooring and furniture shop one of the area’s most venerable retail outlets. While a glance at the goods on display in the window might lead you to believe that some of the stock has been there since opening day, the proprietors are obviously doing something right to have remained in business for over 60 years. Back in the 1980s, the building now known as the Chinese Christian Church was owned by J&J Levy. William took his photo some time after the company put the building up for sale, when it was clearly in a state of considerable disrepair. The distinctive building had already endured something of a chequered history since being opened in 1892 as Knighton Public Hall, the headquarters of the Liberal political party. 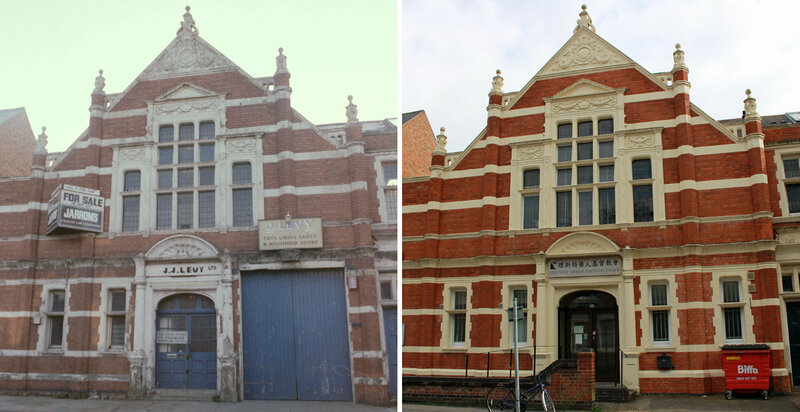 There followed an unsuccessful stint as a cinema, then then it was used as a factory for the manufacture of hosiery and footwear and finally, by J J Levy as a warehouse for storing wholesale supplies. It’s lovely to see that the place has seen a reversal of fortune in recent years, with the current occupants having spent considerable time and effort restoring it to its former glory. William took this photo of Montague Road from just outside The Clarendon pub, which perhaps explains the slightly jaunty angle! My second ever post for this blog was called Clarendon Park After Dark and was a narrated pub crawl between each of Clarendon Park’s drinking holes. I was particularly impressed by The Clarendon’s selection of real ales and its comprehensive coverage of live sporting events. It also has a large, sheltered beer garden – the only one in Clarendon Park – which makes it a great place for a drink or two on a sunny summer’s evening. 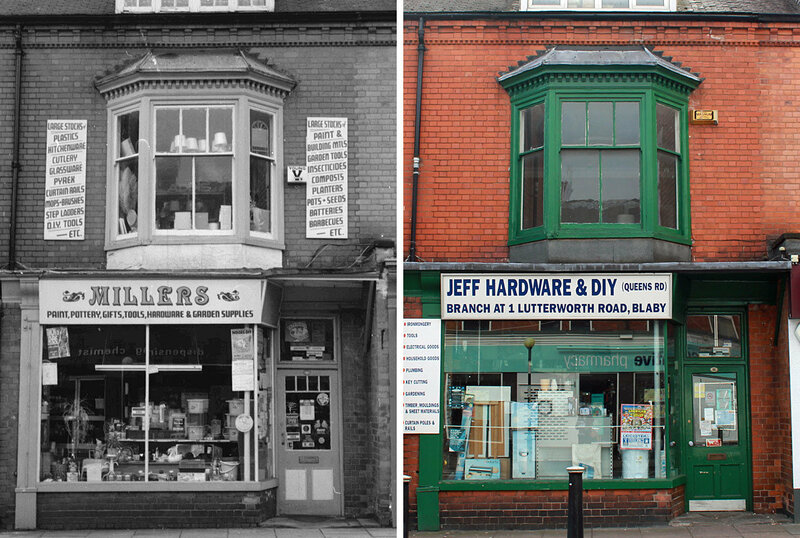 Millers hardware shop at 91 Queens Road has since become Jeff Hardware and DIY. This little place is an absolute goldmine of DIY and kitchenware supplies – for a small shop they pack a lot in and it’s well worth popping in to see if they’ve got what you need before schlepping over to Homebase or B&Q. Proof that not everything changes! 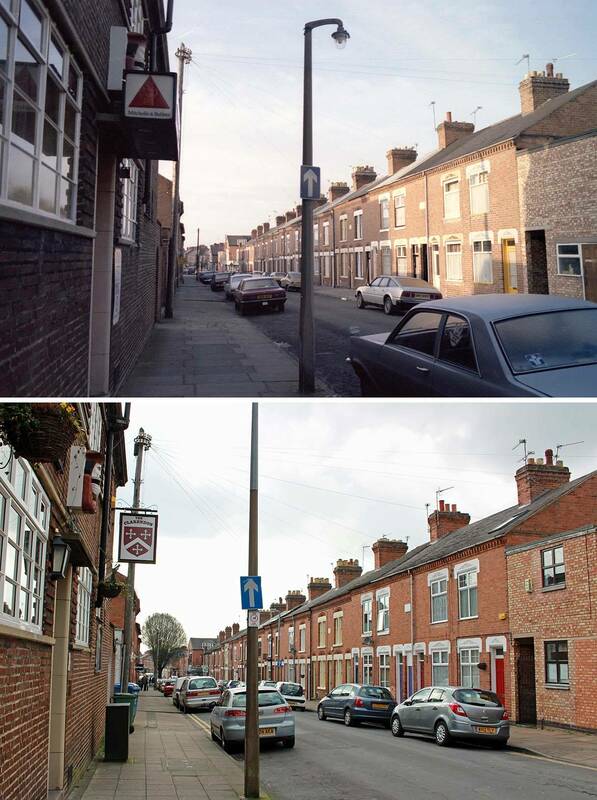 Despite having been taken around 20 years apart these two photos looking north at the corner of Queens Road and Howard Road are virtually identical. I know someone who used to live in a flat in this corner building. Not a great story that, but the best I can do for this one. There’s something quite comforting about the fact that so many of the buildings on Queens Road have been used for the same purpose over the years, even if the business names have changed several times. 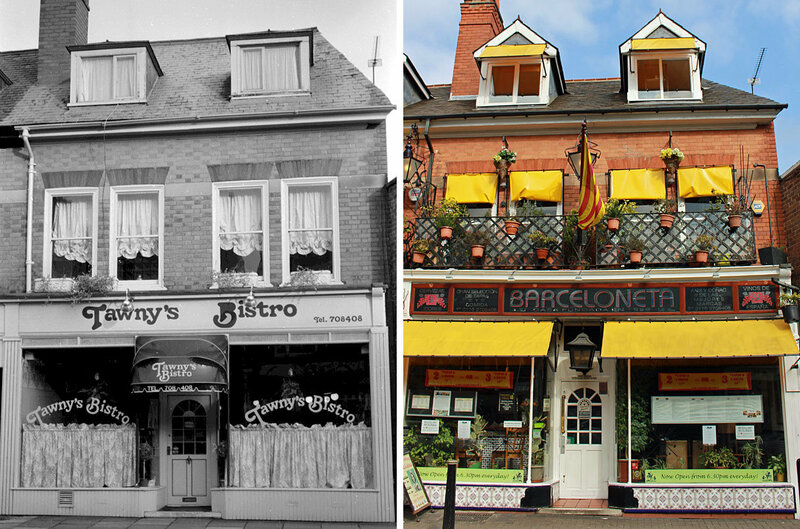 Barceloneta opened at 54 Queens Road in 1990, and has been serving traditional Spanish dishes along with an extensive range of accompanying Iberian wines, liqueurs and aperitifs ever since. You can read my review of Barceloneta elsewhere on the blog. 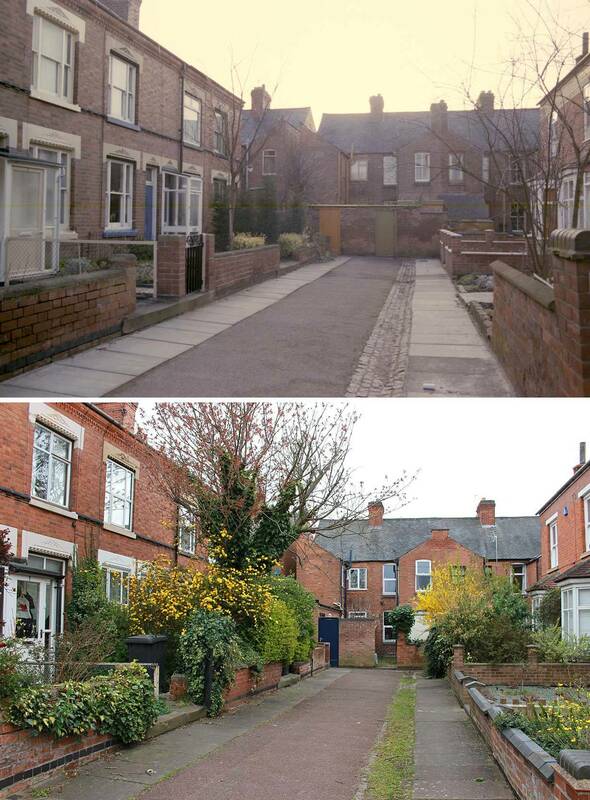 Orlando Road is one of my favourite little corners of Clarendon Park, and judging from these photos its pretty collection of houses has only grown lovelier over the years. William remembers the ginnel* which runs from the south-east corner of Orlando Road through to Cecilia Road, which is one of my own regular short cuts. Another benefit of passing this way is the possibility of bumping into Orlando the black and white cat, a particularly friendly feline resident! *Evidence of my northern roots has crept into the above paragraph – I’m reliably informed that in these parts you refer to a narrow alleyway between two buildings as a ‘jitty’. 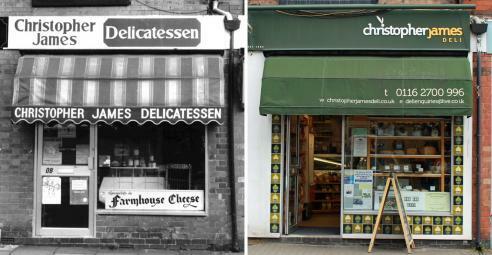 Pictured above are three shop fronts which I’ve been unable to place in modern-day Clarendon Park. The location of Queen Bee leather shop is a total mystery, although the name suggests that it was somewhere on Queens Road rather than elsewhere. William remembers Splash as being somewhere close to the junction of Queens Road and Howard Road. Meanwhile, the little antique shop was somewhere on Montague Road, perhaps between Edward Road and Oxford Road. Do you recognise any of these mystery shops? If so, let me know using the comments box below and I’ll add them, along with the present-day view, to the next of my ‘Then and Now’ posts. I wish I had taken some myself in the 70’s. My mum use to do all her shopping on Queens Road. Pity there are no pics of all the banks/Building Societies we had too on Queens Road. Alliance, Natwest, Halifax, Barclays, any others? Tawny’s Bisto was a friends meet up at Xmas Eve in the mid 80s before we all settled down. A friend resided at 52 Queens Road which was the top flat above the blue window in the early 80’s it was always a challenge to get to the top before the light timer went out. Wasn’t there another shop near Howard Road next to Barceloneta(!) Samsons? Womens clothes which may be were Splash is shown. Thanks for sharing these memories Peter. It’s so true that it rarely occurs to us to document the ordinary and the everyday. Traditionally the camera only comes out for special occasions and holidays to more exotic places. It’s a shame, because it’s often the things we take for granted at the time that are responsible for the most enduring memories. I have a photo of John Collins butchers and fishmongers ready for the next post. It was in the building currently occupied by Age UK. I remember Queen Bee well on Queen’s Road, although I can’t quite remember if it was on the corner with Ceclia Road or next door in what is now Michael Grundy jewellers. Queen Bee was indeed on the corner of Cecilia Road. Handbags and leather goods, I think. I used to live in the flat above the carpet shop on Queen’s Rd, Keith Something, before he moved to Welford Road, and if I recall correctly Queen Bee was opposite. Hi Matt, I don’t have a photo of the sewing machine shop unfortunately, but I’ll certainly let you know if I track one down at any point in the future. I’m really impressed by your website about the Corah factory – the photos are absolutely beautiful. I love the night time images and the ones of the derelict interior – they’re haunting. What a fascinating place! I too remember Queen Bee very well. It was on the corner with Ceclia Road. I bought two handbags from there in the late 1970s – one of which I still have! I used to push my son in his pram all around Clarendon Park in the late 1960s/early 1970s. There was The Chocolate Box, I think it was called on the corner of Howard Road, a toy shop between Howard Road and Ceclia Road and then Queen Bee – so we both looked forward to our walks on Queens Road. And if the cake shop (Macopa, was it called?) was open on Clarendon Park Road our day was complete. Lovely shop, beautiful cream cakes (I especially remember the rum babas & coffee eclairs) & the smell of fresh ground coffee which they also sold. Happy days! I am sure I had my tonsils operated on in a small hospital on Clarendon Park Road. Does anyone have a photo of this? I think I’ve heard this little hospital mentioned before Helen – was it on the site now occupied by St John’s School? I’d be interested to see if anyone has a photo. Fantastic blog, Ruth! Thanks for the sweet words above about my Macopa easter egg post, and I am so glad to know about your blog. I arrived in Clarendon Park in 1967 and left in 1982 and apart from the odd visit back there in the 80s and early 90s, I haven’t been back since. I ‘google street viewed’ Queens Road and it has changed quite a lot, and yet it is still so familiar. Unsurprisingly a lot of the shops I remember are now gone: Roberts’ newsagents, the Walkers – well, it wasn’t really a butcher’s – it sold just pork products (and crisps of course) – I especially remember the Christmas window displays of big pork pies piled high, ready for the traditional Chrimbo breakfast of pork pie and stout), Hinds the Chemists, the Chocolate Box (wine merchants and sweet shop – what a combo!). And a funny little women’s dress shop round the corner in Clarendon Park Road called Bettina’s, and the Citroën garage with all the ‘broken backed’ cars (as they seemed to me then – little did I know about hydropneumatic self-levelling suspension back then. Actually, still don’t now – Wikipedia is my friend). I think there might be a clue in the antique shop photo – it looks like you can read part of a ‘Montague Road’ street sign reflected in the window. So happy to have found this blog – there goes the rest of my working day!! Thank you Rebecca – I’m so glad you like the blog. Wow – I like the idea of a shop specialising in wine AND chocolate – a fantastic combination indeed! And great detective work on the antique shop photo – I feel like the net is closing in on the mystery shops! Ohh I love this! Not long ago I found a website called Windows on Warwickshire and it had this massive database of photographs of my hometown going all the way back to the 1800s! Makes you feel awesome. Great pictures of when I used to live between 1953 and 1962. Do you by any chance have any pictures of number 86 Queens Road which was a boys and girls outfitters which was by the number 27 and 28 bus stop just before Clarendon Park Road. It was called FORRYNS. Appreciate any one who can help me get a picture of the property. Thanks Mike, I don’t have any photos of this shop but I’ll have an ask around and see if I can find one. In the meantime, if anyone reading has a photo they’re happy to share, let us know! Hello there, does anyone remember a small farm on clarendon park road? it was very near to little johns pre school before it was built (and yes i remember the hospital where you had your tonsils out too!) I must be going back to the late 1960’s/ early 1970’s…would love to find out what happened to the farm, seems like a dream after all this time. I have found this so interesting, was born in Leicester in 1949 and lived for 9 years in Avenue Road Extension, went to the original St John the Baptist School and can remember walking along Queens Road and also going to a youth club on a Friday evening, also buying sherbert dips in a sweetshop near to the school. Am trying to put a memory book together for my mother, so your info is great. There was a cake shop on the corner of Montague Road opposite the Flower Corner with a jazz club upstairs. Early 90s. Names anyone? Landsdowne jazz club?